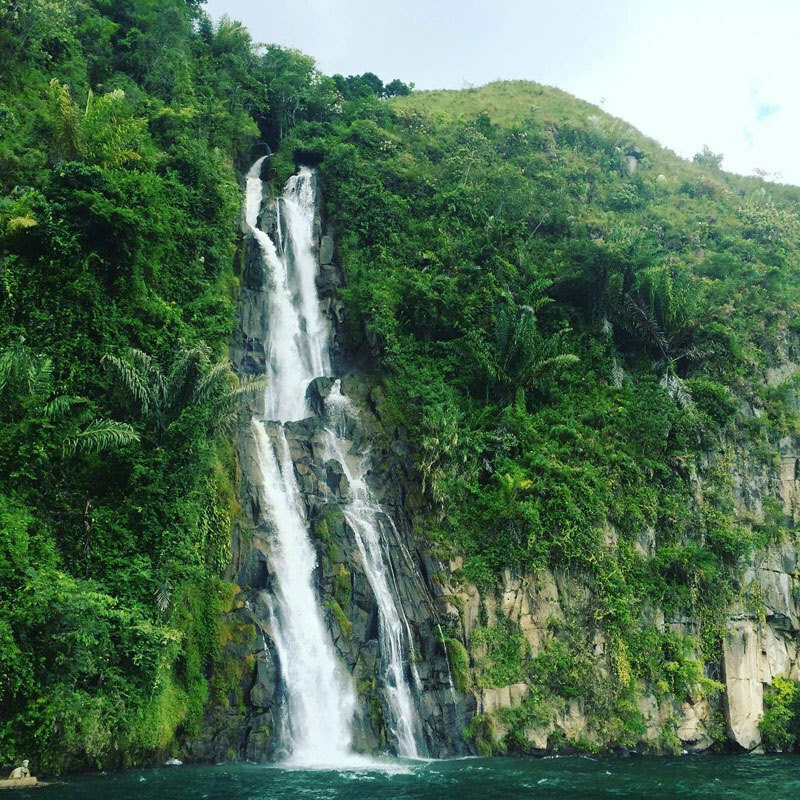 Why should you travel to Lake Toba? 1. Nature and tranquility – Imagine spending a week or two just doing nothing, enjoying nature and recharging from draining social interactions that are part and parcel of our daily lives. 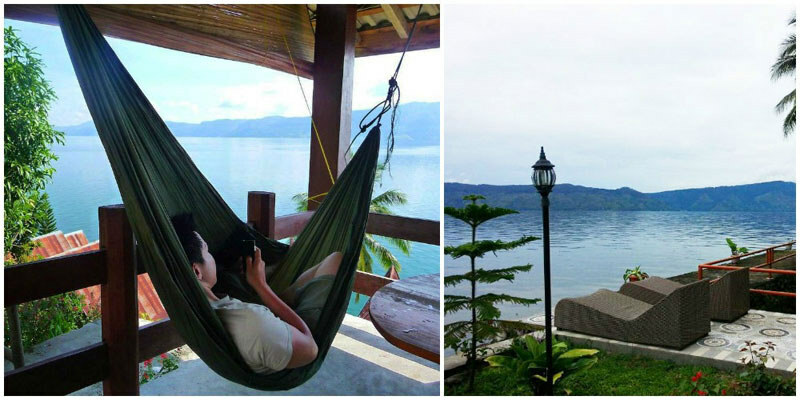 That’s the sort of tranquility you’ll find in Lake Toba! Doesn’t that sound singularly awesome? 2. Chilly weather – Sometimes we take time off for a trip overseas, just to get away from our everyday routine. We find there’s nothing better than Lake Toba’s lovely chilly weather – the perfect sweater weather for snuggling up to lovely views. 3. Breathtaking landscape – If you’re interested in ditching the urban landscape for sweeping vistas and rare fresh air – then this enormous crystal clear lake that’s almost twice the size of Singapore is what you’re looking for. 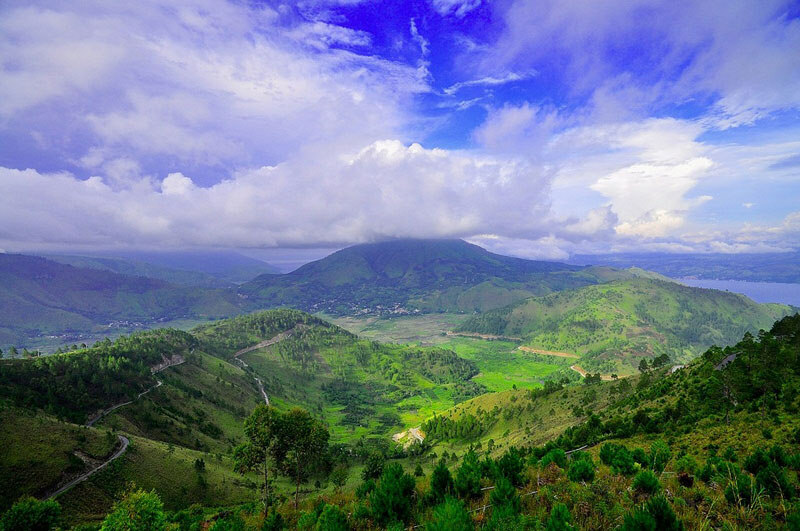 You’ll find dramatic views here as it’s located on a super volcano in Northern Sumatra that has been dormant for the past 74,000 years – and situated amongst towering mountains and drifting clouds! 4. The Batak people and culture – It isn’t just a place where you get to love yourself as much as you want, though. Chances are, you’re going to fall in love with the friendly Batak people and culture, who make their home on Samosir island, a little island sitting in the centre of the lake. 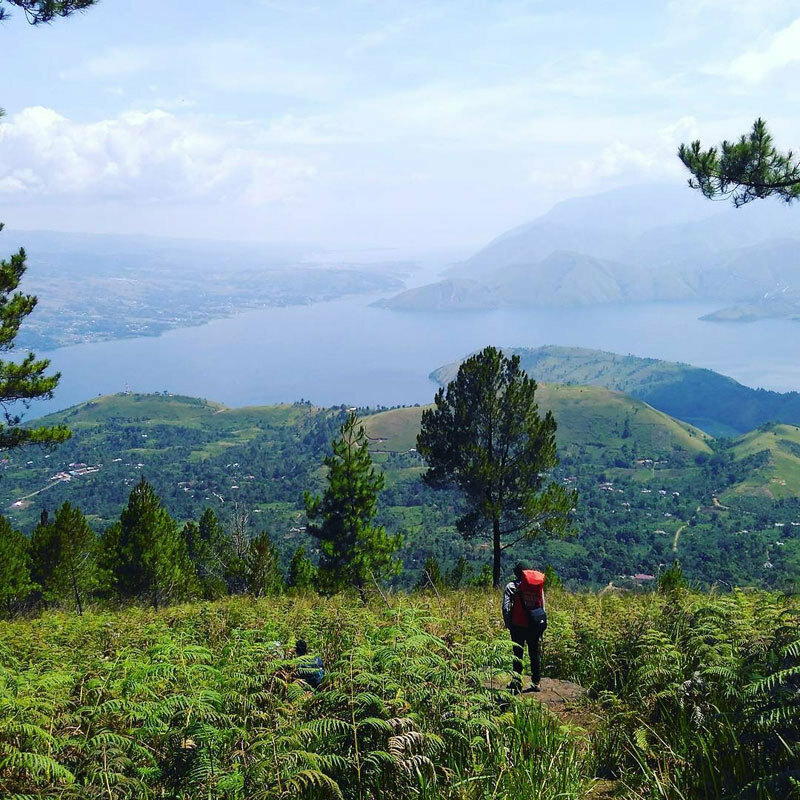 Although the gorgeous views that surround it have given Samosir quite a reputation, the island remains untouched in all its nature and greenery. Leave your work behind, and get on a flight – it’s high time for some mind and body healing. 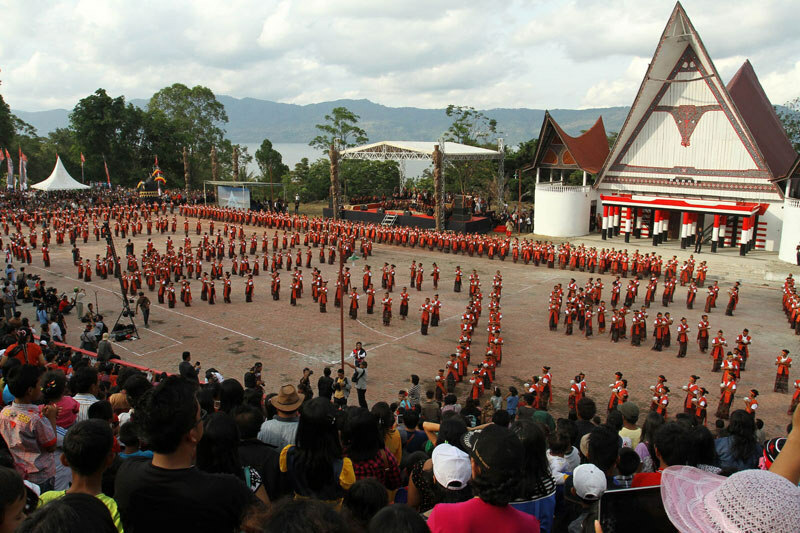 This period every year is when you get to have a blast partying it out with the locals at the Lake Toba Festival, an annual event that showcases local art, music, and sports; it includes exciting activities such as dragon boating competitions, art performances, and even fashion shows. Note: Be sure to check out when the festival will be held before you plan your holiday, as the dates are subject to change every year! Not a fan of hanging out with crowds? The dry season occurs between May to September, when the views are at their very best and no crusty cloud is there to (literally) rain on your parade. The month of May is also the golden month when the weather is a perfect degree of warmth – we’re definitely not fans of swimming in sweat and rain. Rain tends to come in buckets during the winter months, so it wouldn’t be a great idea to visit Lake Toba during this period… unless you’re a fan of grey skies and umbrellas as permanent accessories. Chinese New Year is when tourists flock to Lake Toba and everything goes up, up, up – prices, crowds… the only thing that goes down is your satisfaction. Currently, there’s no direct way to get to Samosir – you’ll have to take a plane to Medan, travel to Parapat, and then board a ferry there to Tuk Tuk on Samosir Island. It’s not exactly as easy as abc, but we believe some things are worth working for. Besides, we’ve broken everything down to make things easier for you. Step 2 (Duration 4 – 6 hrs): 3 ways to get to Parapat (a small town on the edge of Lake Toba) from Medan – Board a taxi/private car/bus. Note: Mini vans that seat up to seven passengers. The car will only leave when all the seats are taken up. You can book one from your hotel in Medan or at the Transportation Desk at the airport. Note: Only for non-fussy travellers; the buses can get very crowded and smoking is allowed. 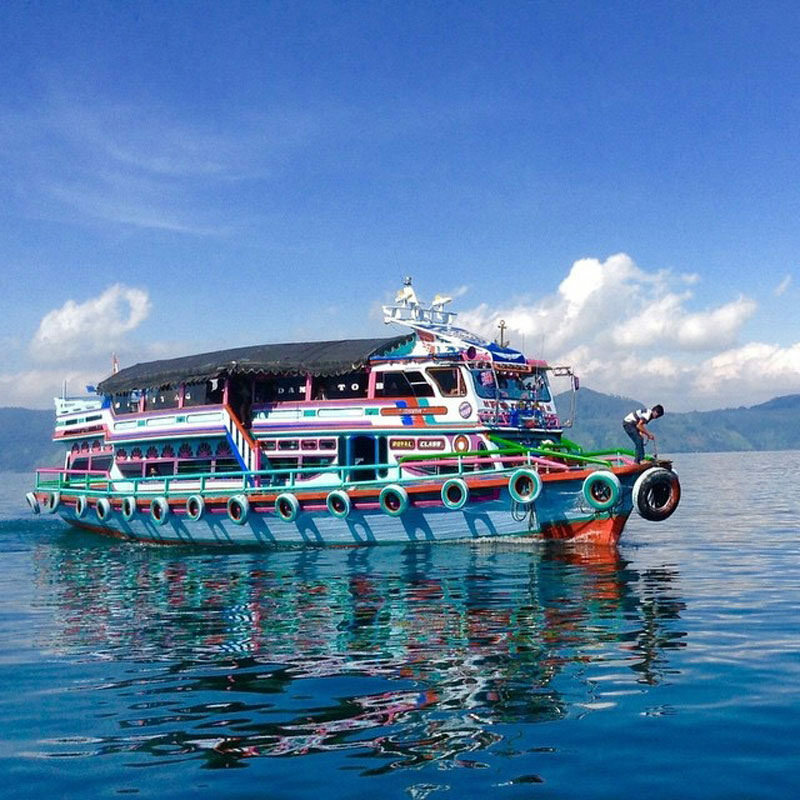 There is a regular ferry service that operates at half-hour intervals between Parapat to Tuk Tuk on Samosir island. You can buy your tickets on the boat. Important note: Please be reminded that the above departure time is subject to change! Don’t miss the last boat, or you’ll have to stay on Parapat for the night! 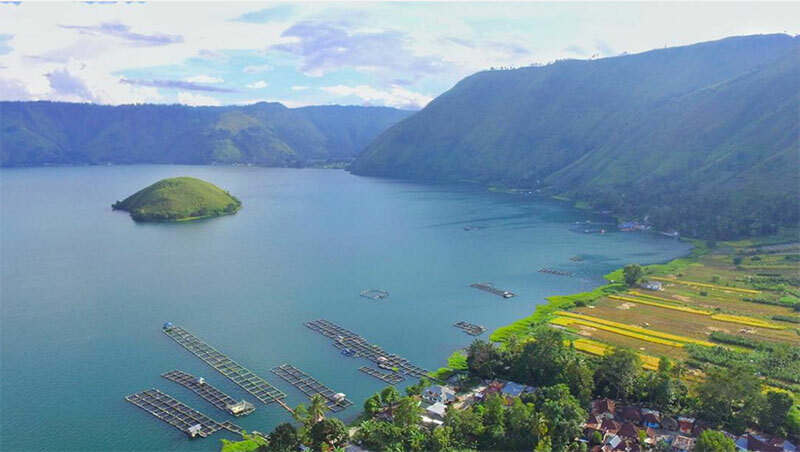 Are you still confused about what exactly Lake Toba offers? 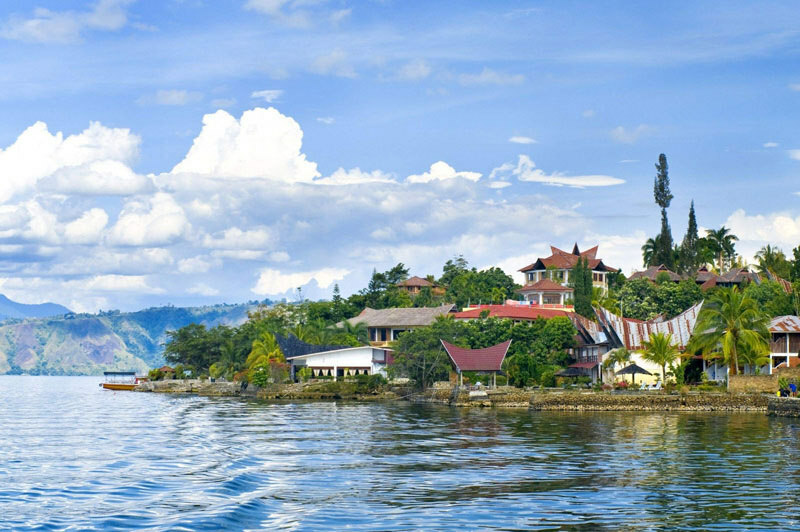 Get bite-sized information about this fascinating destination at the Indonesia Tourism Board’s Official Lake Toba page! You’re surrounded by water and scenic lake views; why would you want to do anything other than travel around by boat? As Samosir island’s main mode of transport, boat rides are also really cheap there, costing around US$1 per trip. Compared to your usual bus rides, you might even save some money while you’re there! However, if you’re more interested in being a badass and traversing those bumpy roads like nobody’s business, you can always choose to hire bicycles or motorcycles as your vehicle-of-choice. You can get bikes at most cottages and guest houses in Tuk Tuk for a very small fee. But if you’re not planning to return home with a few more bumps on your person, you might want to watch out – road safety isn’t at its best here. Bike riding has its advantages, though. The plateau located on the east side of the island is a popular biking site, as you’ll get to pass by many traditional villages and enjoy a panoramic view of the lake. Note: Most of the motorcycles for rent are privately owned by the renter, and you may have to return them before sunset or at the owner’s discretion. Try not to flout bike return policies, or you may end up racking up some extra charges! Some accommodations offer tour bookings that tourists can sign up for. If it’s your first time around and you’re not confident enough about making it on your own, here’s some professional help for you. Offers a regular Samosir sightseeing tour visiting all the well known touristic places such as Ambarita, Tomok, Pangururan. Offers a full Samosir Day Trip by Car under their Credo ‘Exclusive & Excellent’. Only applicable to guests actually staying with Horas Family Home. 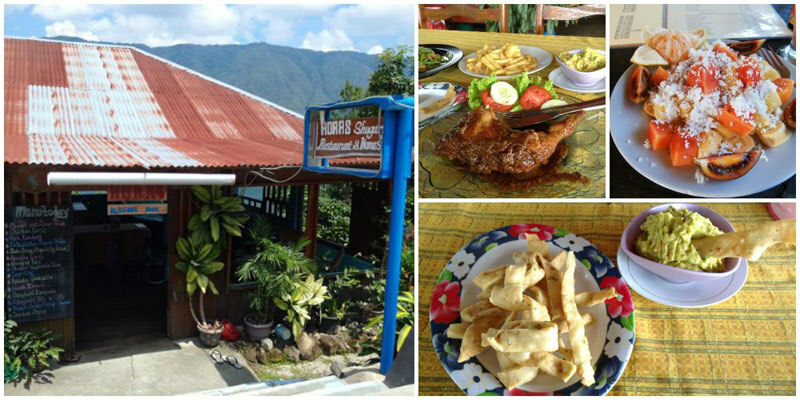 Offers much more than only regular sightseeing and includes adventurous and off the mainroad exploration of Samosir. Some hotels and guest houses, such as Carolina Hotel, offer transportation services. If you prize comfort, this is the way to go. As much as Lake Toba is an awesome place to kick back and enjoy your privilege to do absolutely nothing, it’s always good to prepare for a rainy day. 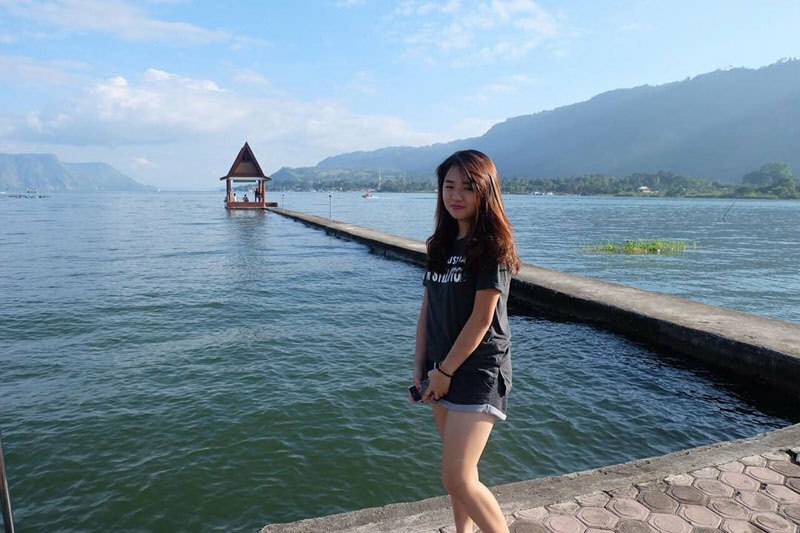 If you ever find yourself bored and itching to find something fun to do, fret not, because Lake Toba can be an exciting place to visit as well. 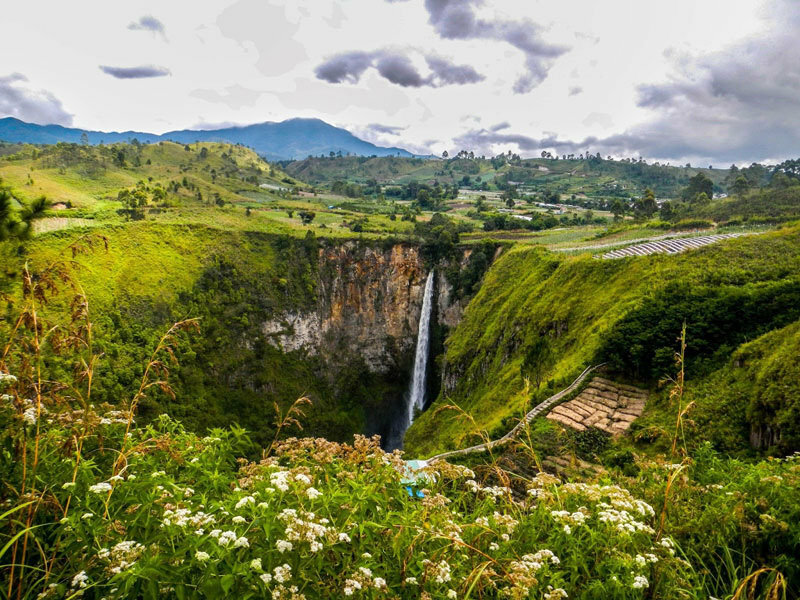 Aside from the annual Lake Toba Festival, the area is littered with historically rich cultural monuments and nature sites that are mind blowingly beautiful. Whenever you wish, an adventure is waiting for you. 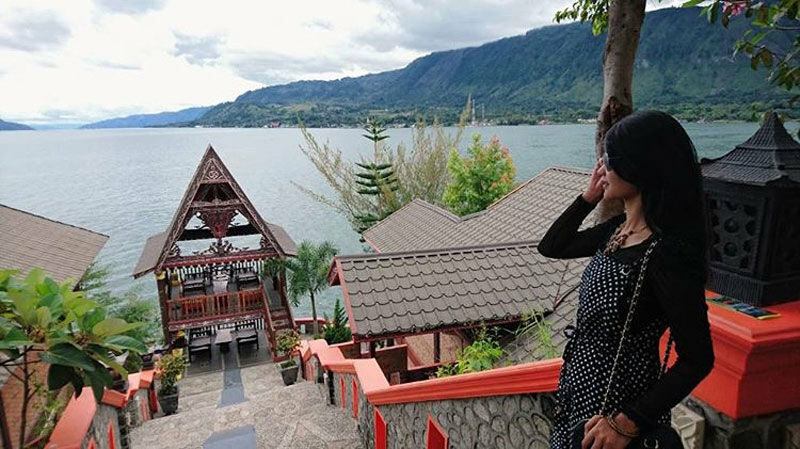 Living up to its title as the centre of Lake Toba’s tourism industry, Samosir island has a myriad of activities to do and sites to visit. This stately waterfall is one of the popular tourist attractions on the island. Water falls in majestic waves from the top of a cliff directly into the lakewater, making for an interesting sight. On hot days, you can enjoy a cool swim around this natural wonder, as well as fishing. Or, we don’t know, you could take tons of photos to show your friends. Getting there: You can rent a boat at Carolina Hotel to take you there. 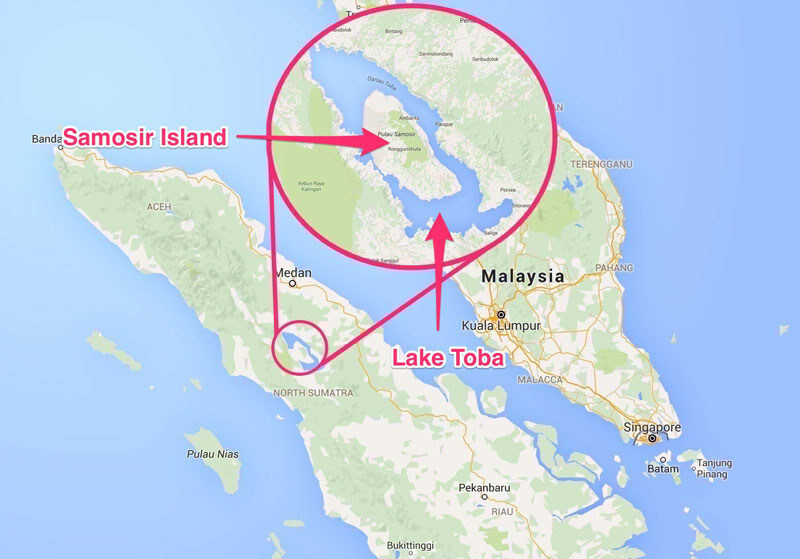 Boat rentals cost around IDR$500,000 – IDR$600,000. 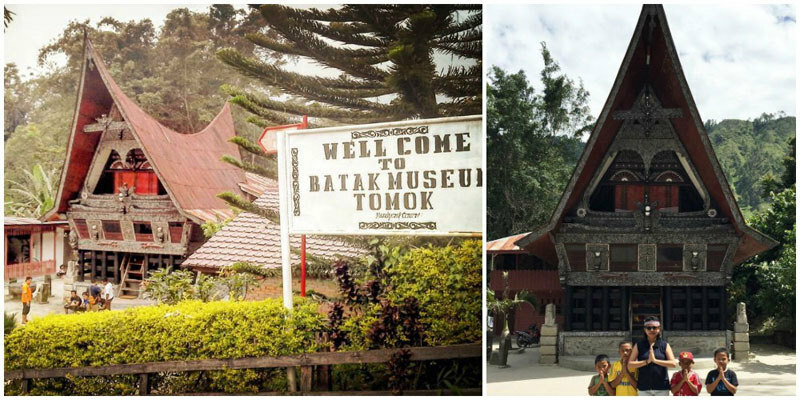 If you’re interested in the rich Batak history and culture, what better place to experience it than at the Batak Museum? This grand building, before stepping into its role spread knowledge of local culture, used to be the home of the deceased Raja Sidauruk. Now, it is a major tourist site and the place where traditional dances and the Sigale Gale puppet performance are held. The Sigale Gale puppet is a life-sized wooden puppet that is used during Batak funeral rites as a vessel for the spirit of the dead. Although its origins are a little creepy, the puppet is now a staple in dance performances that are well-known to tourists. 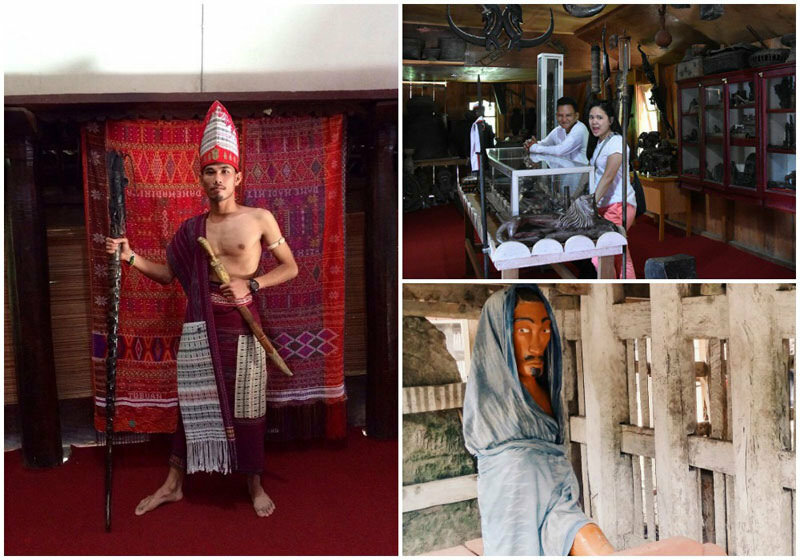 Getting there: The Batak museum is located at Simanindo, 19km away from Tuk Tuk. It costs IDR$50,000 to watch the puppet performance. 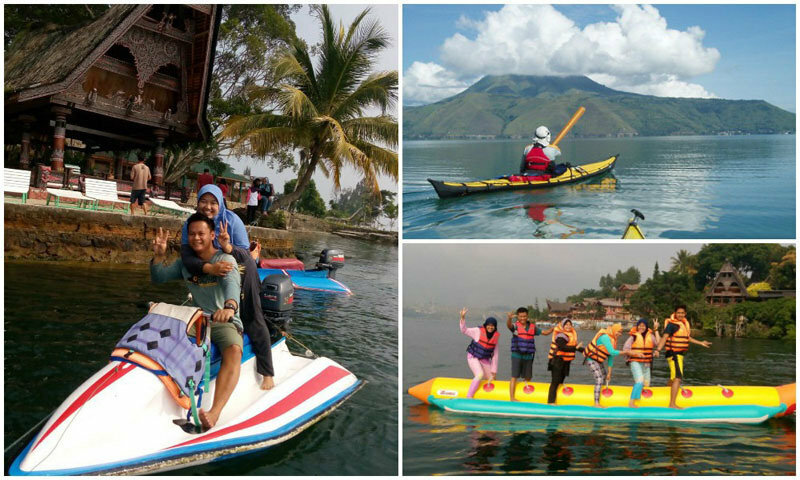 Being surrounded by nothing but water, it’s not surprising that Samosir offers a wide variety of water sport activities for tourists. Here, you can try your hand at jetskiing, go on a banana boat ride, and even kayak across the clear lake waters. Working out, keeping fit and doing all these against a breathtaking backdrop? That’s one good deal you won’t get anywhere else. How to: Most resorts offer watersports facilities. You can find them in Tuk Tuk as well. 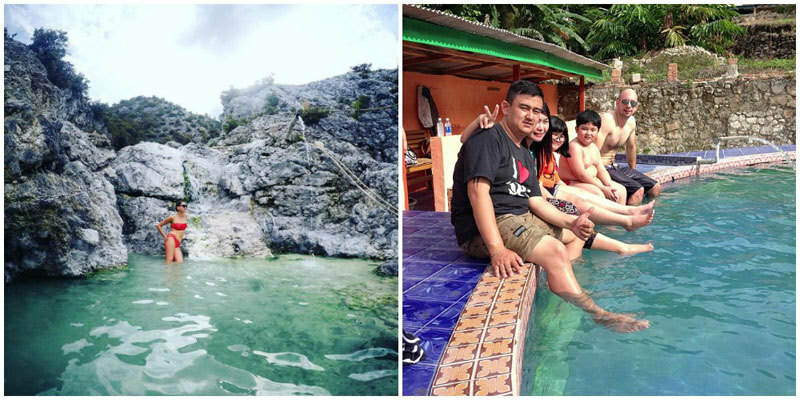 Who doesn’t like natural hot springs? At the feet of Pusuk Buhit, just across from Pangururan, you’ll find some hot springs. It costs IDR$2,000 to enter the area, but access to the pools are free, except for a pool for foreigners that costs IDR$10,000 to access. A word of advice, when we say hot spring, we really do mean hot spring. Don’t try swimming around in it, or soaking your whole body into it at one go – chances are, you’ll end up hopping back out again. 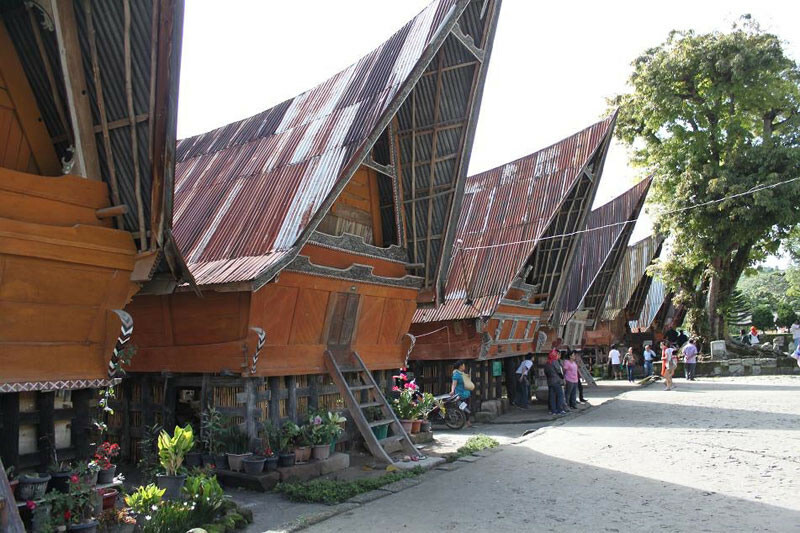 Tomok village is a small, traditional village on Samosir that preserves many important historical sites. 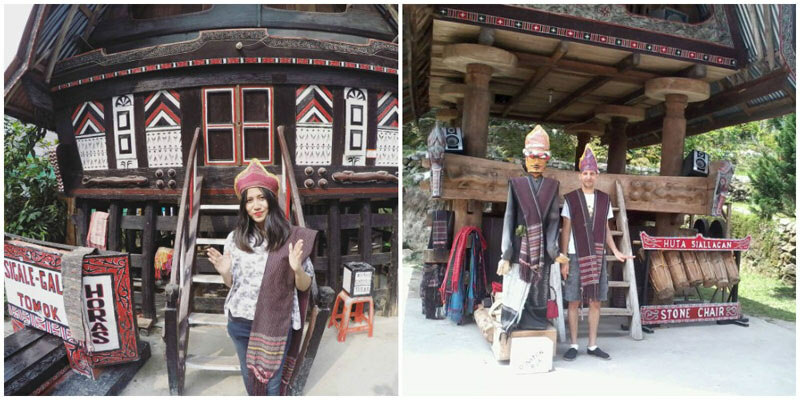 In order to get to know more about local culture, this is one stop that you cannot miss. Not only does the village feature some beautiful traditional Batak houses, it’s also home to the stone tomb of the late king Sidabutar. 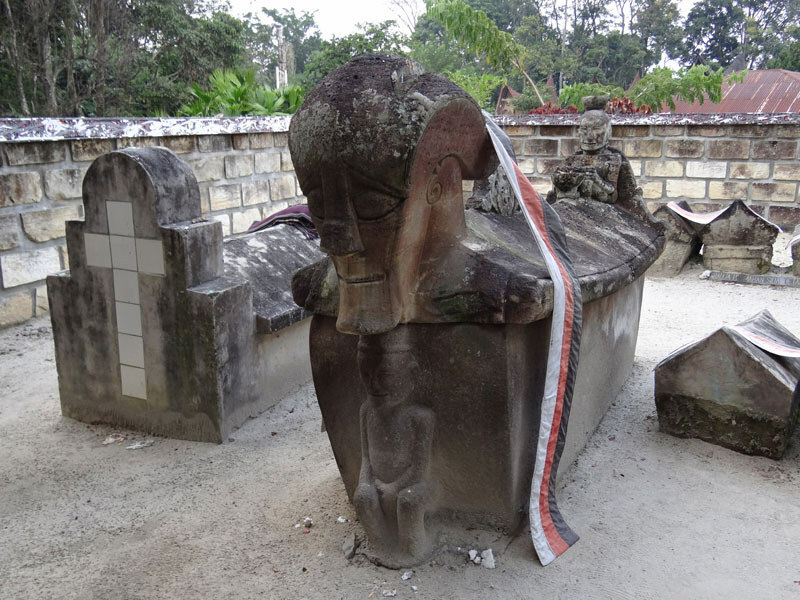 You’ll also find a series of stone statues, as well as souvenir shops that sell meaningful Batak souvenirs. Just in case you didn’t manage to watch the Sigale Gale puppet performance at the museum, you can also find it here. Go ahead and take a trip back into the past of the Batak people, and remember to buy a souvenir home to record your travels! The first must-go on the island is none other than Tuk Tuk, the area where tourists, good food, and unique resorts converge. Most tourists will doubtlessly end up in Tuk Tuk when they visit the island, as many good hotels can be found here. Other than being a good vantage point to admire the views of Lake Toba, Tuk Tuk also offers some good shopping and drinking spots. 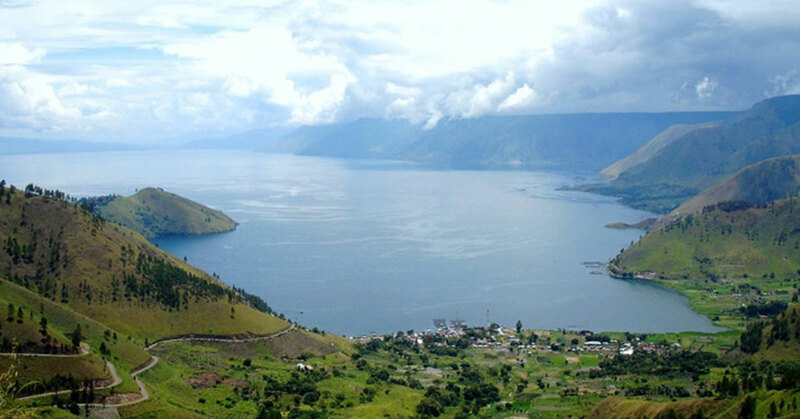 The village of Ambarita is another old village on Samosir island that has been witness to many historical events. 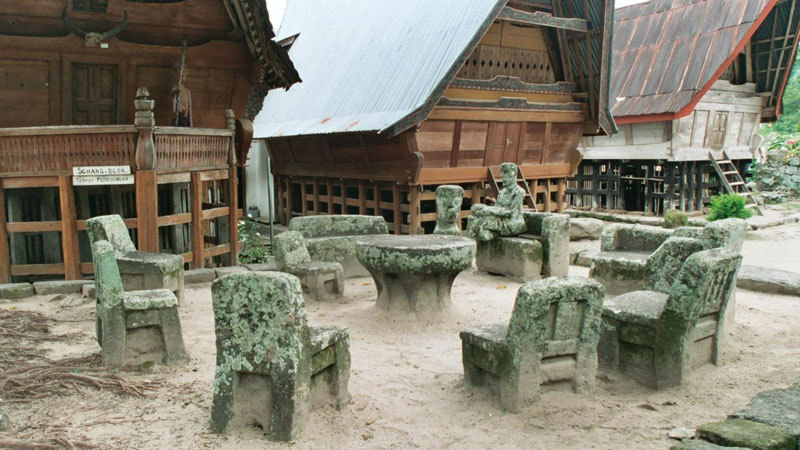 The most popular spot in the village is Huta Siallagan, where a confusing mix of stone tables and chairs can be found. No, they’re not there for you to sit on. They’re in fact part of an ancient courtyard, where the kings convicted criminals and decapitated them on the spot. It’s a story that makes you think twice about sitting down, right? 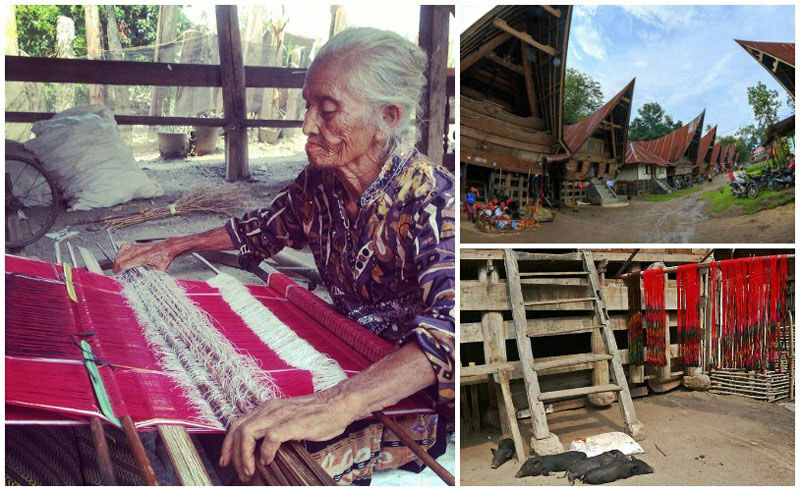 Fashion lovers will appreciate the chance to get in touch with the Batak people’s traditional cloth, the Ulos, at this tiny village. These intricately printed cloths are entirely handmade with traditional tools – beautifully crafted labours of love. Here, you get the chance to view the entire Ulos-making process, and when it’s over, you’ll even get to pick out your favourite and buy them from the maker! Although Parapat is most often seen as a place to stop by on the way to Samosir island, it also has interesting activities of its own. One of these is the weekly market that can be found on Saturdays next to the ferry wharf. 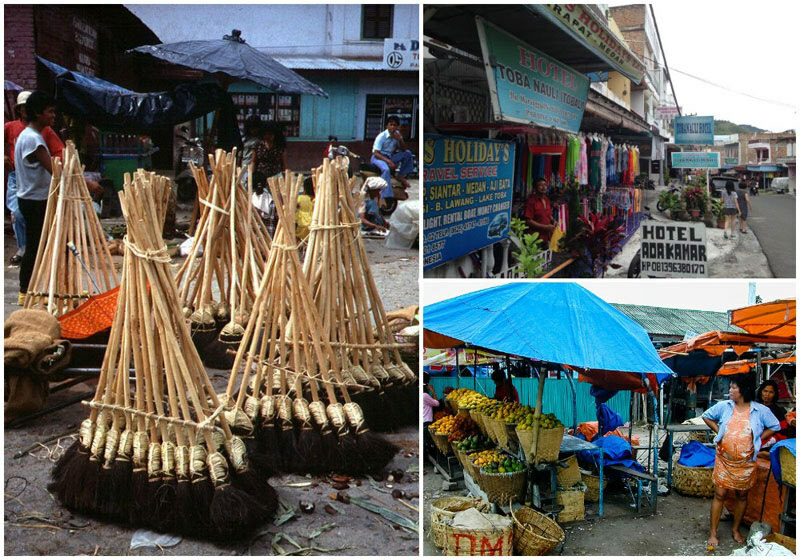 On these days, locals converge to sell interesting Batak handicrafts, fresh fruits and vegetables. If you happen to pass by on your journey, do check it out! Getting there: The market can be found at Pekan Tigaraja, close to the ferry area. Do you know how the town of Parapat got its name? The answer can be found in the hanging rock located there. 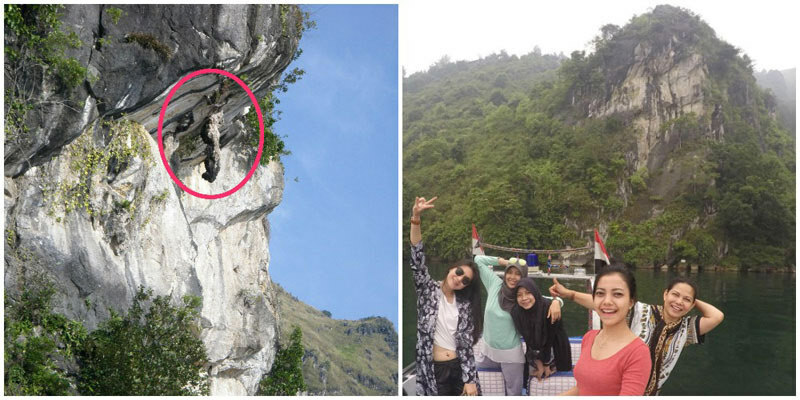 The girl-shaped rock that hangs from the wall of a cliff is said to be the manifestation of a young girl who was trapped in the mountain and never managed to be rescued. 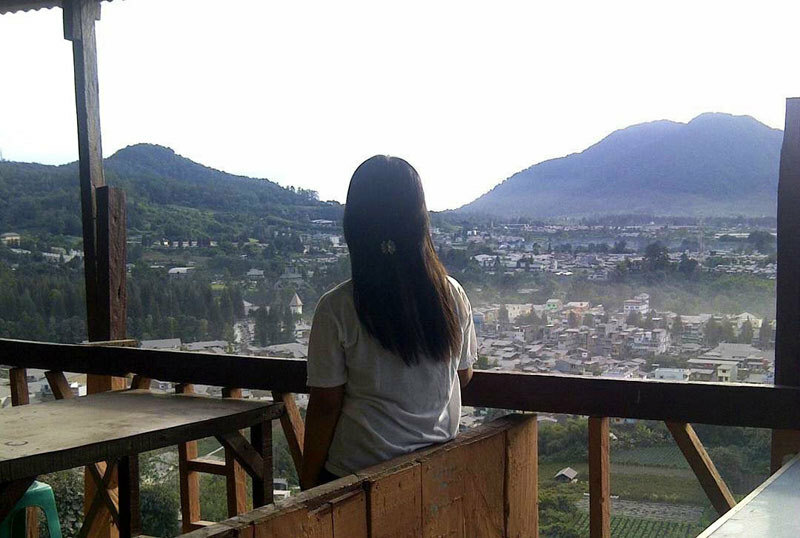 Because she repeated the word “Parapat” before she was buried alive in the mountain, the city was given the name Parapat. If your schedule is loose, don’t be content with exploring just Parapat and Samosir island alone. 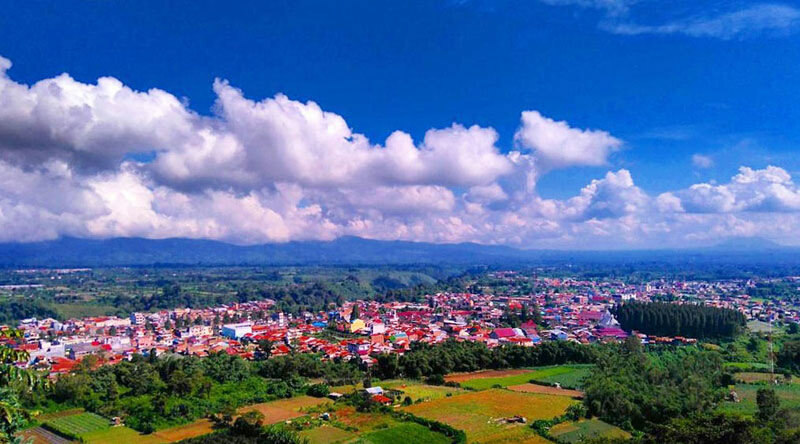 On your way back to Medan for your return flight, you can always travel northwest to the cities of Merek and Berastagi to catch a glimpse of some more natural wonders – there’s no such thing as too much adventure. 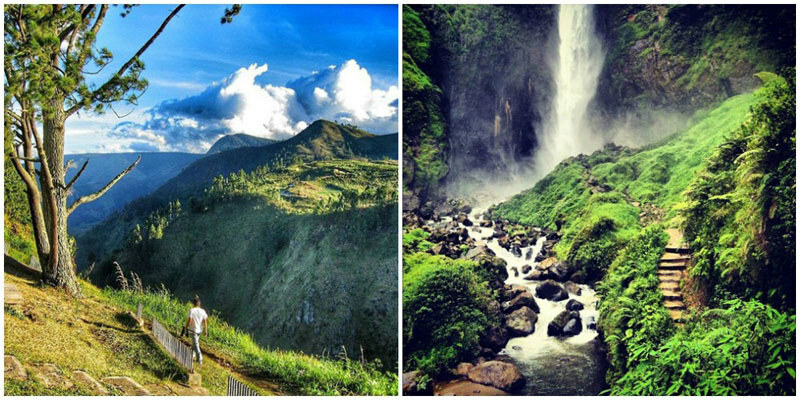 If you’re a fan of hiking, don’t miss out on the chance to hike up along this gorgeous waterfall. Reaching a height of 120m, this stunning waterfall is barricaded by endless greenery, making it the perfect destination for your next “I made it!’ photo. Don’t have enough stamina for hiking? No worries, here’s a far easier option for you. 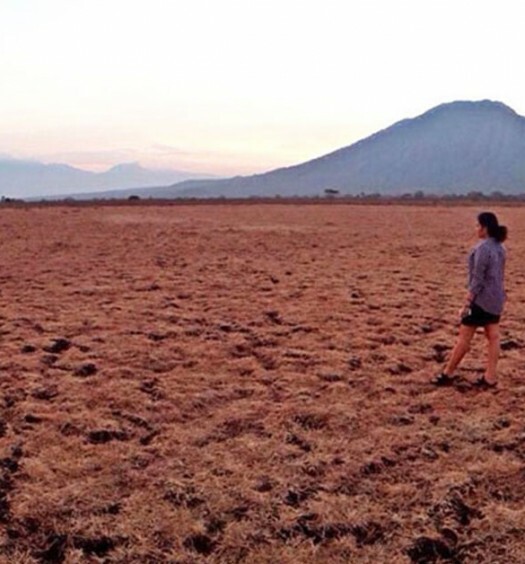 Berastagi’s Gundaling Hill is further north from Merek, and boasts of a great view of Mt Sibayak and Mt Sinabung in the distance. Better yet – you’ll only have to walk for about an hour to reach the top and get your reward. The roads are also paved well, so it’s practically little to no effort. Lazybugs, this is your pick. Getting there: Gundaling Hill is 2 km outside of Berastagi, and a 45-minute walk. You can choose to ride a green Bintang Karo for IDR$4000 (US$0.29). If you travel from Medan, it will take a 2-hour bus/car ride. 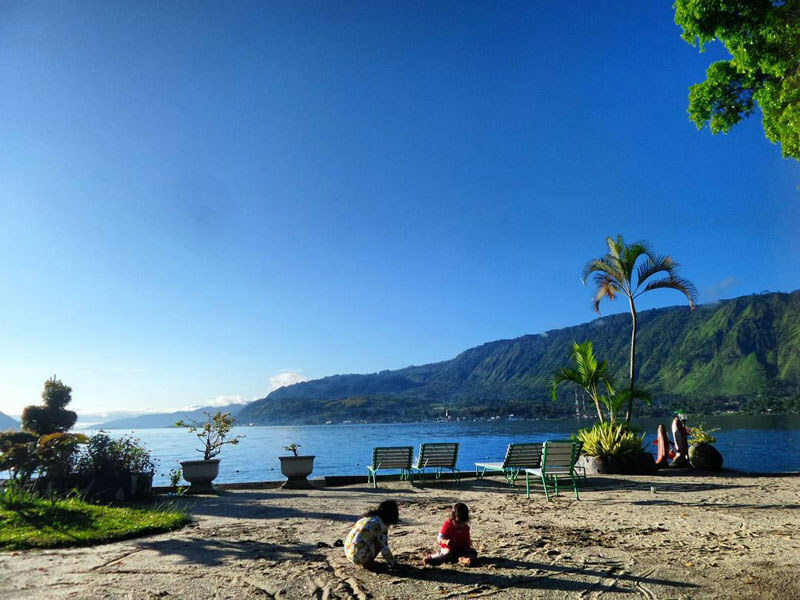 As the center of Lake Toba’s tourism and home of the indigenous Batak people, Samosir island is naturally where most tourists choose to stay the night at. You’ll want to stay in the Tuk Tuk area of the island, where things are most alive and happening – many popular restaurants, guesthouses and bars are located here. 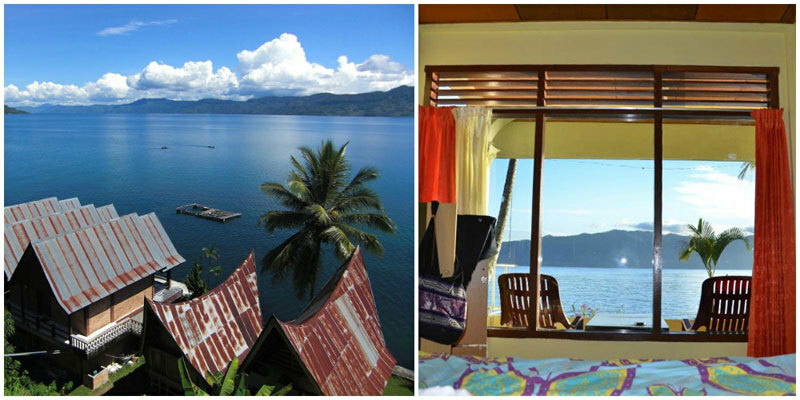 Carolina Hotel is one of the most popular hotels on Samosir island, and rightfully so. For the cutthroat prices that you pay for their rooms, you get a view worth much more than that. 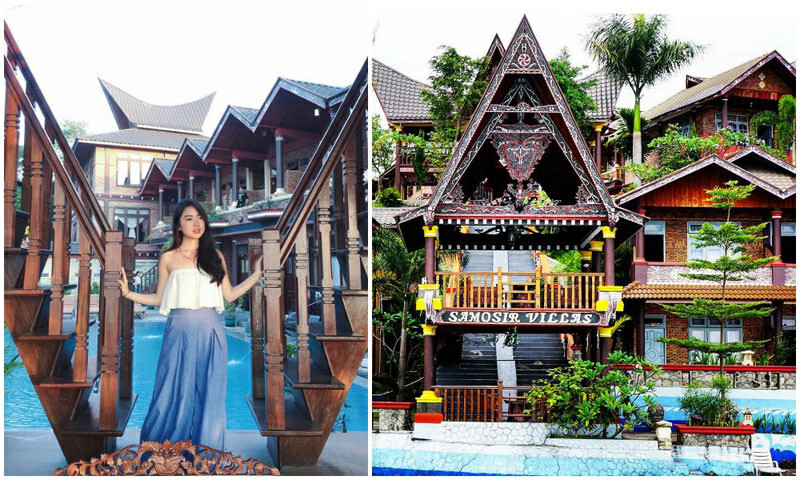 The rooms are also traditionally styled, giving you the full Batak experience! 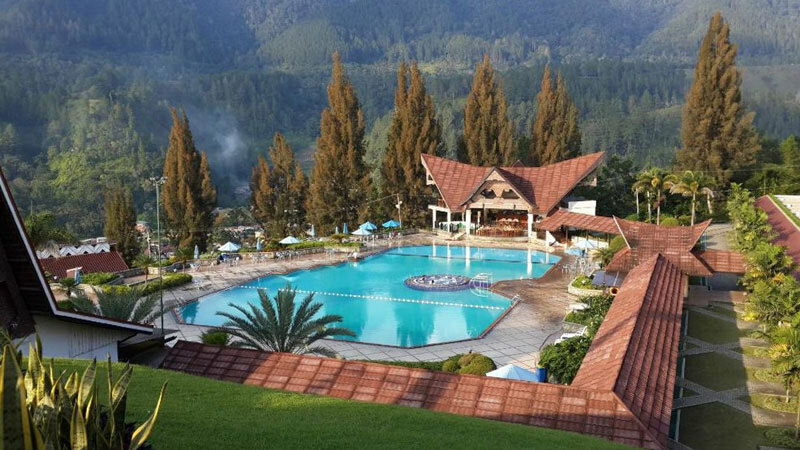 Step out onto your balcony for a sweeping view of the facing mountains and wide lake, take a stroll along the beautifully managed gardens or grab a bite at the hotel’s restaurant overlooking the lake – wherever you go, you’ll be greeted with all the beauty that Lake Toba has to offer. 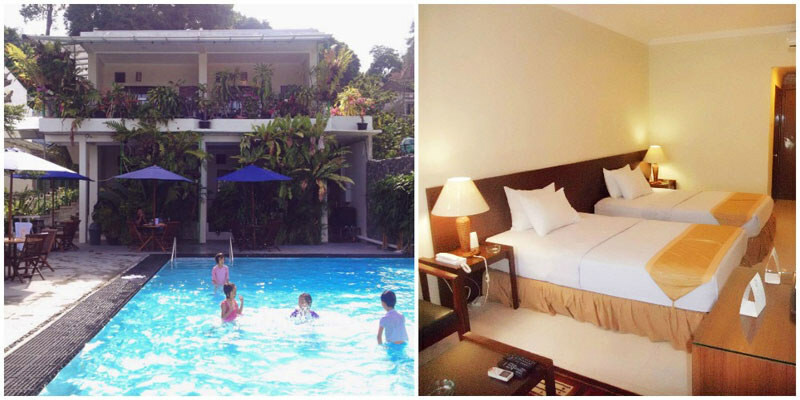 If you’re a family looking to have some family fun, in (obviously) a family-friendly accommodation – bring the kids down to Samosir Villa Resort! 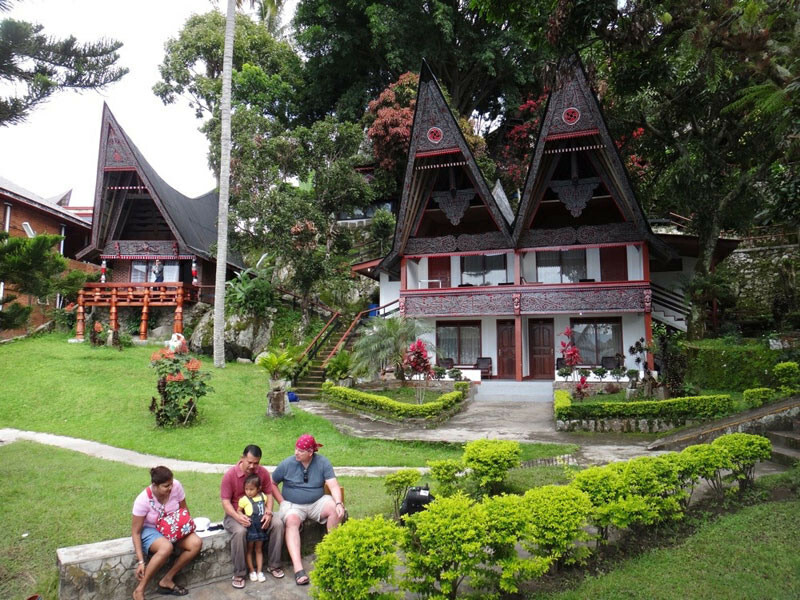 Looking a little like a lakeside lodge resort, why not book a family room for your family’s trip to Lake Toba? While the rooms might be slightly humble in style and amenities (like an electric kettle), the resort more than makes up for it in its features, views, and all-around fun vibes. For nibbles, head to the restaurant for some food if you’re too lazy to venture out. On the other hand, there’s a bar available should the adults want to get a drink or two! 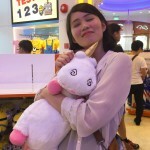 Tend to get homesick when you’re out travelling? 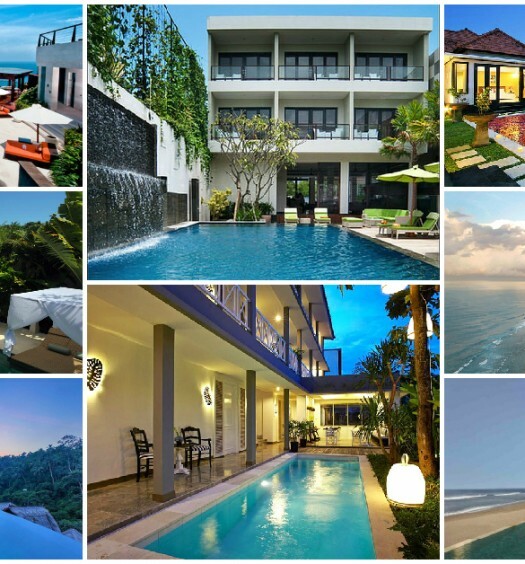 Maybe Mas Cottages will be the place for you. This family-run establishment has been steadily collecting accolades from guests, and has been praised for its friendly, home-like atmosphere and staff. We guess it also helps that the rooms are all located right on the lakeshore – you’ll wake up to an incredibly stunning view every morning. 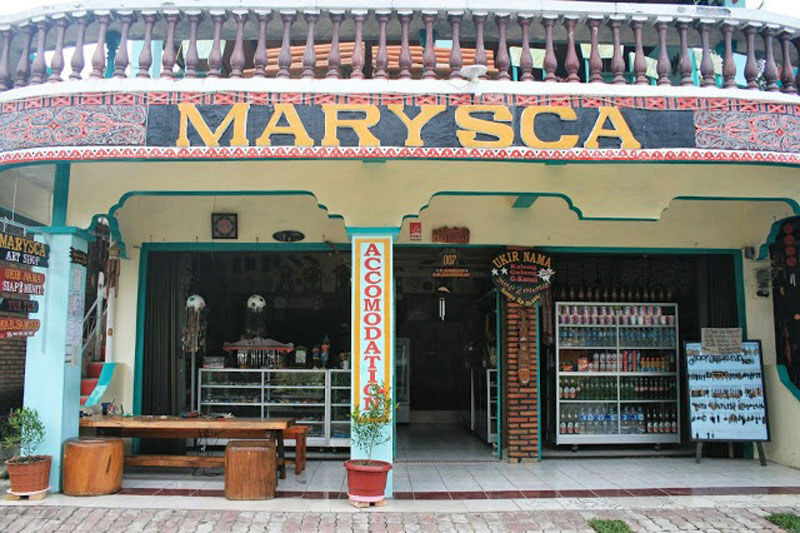 We’d recommend that you stay on Samosir island in order to get the most out of your trip, but we all know about the much hated but often inescapable Murphy’s Law, right? 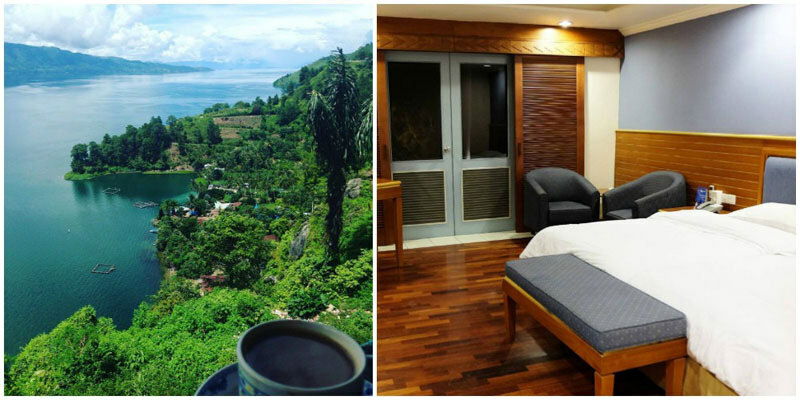 Anything that can go wrong will go wrong, so we’ve got two hotels in Parapat listed down for you. Just in case something does go off the rails (and you miss your ferry to Samosir (*touch wood*), you’ll be well prepared enough to pretend that it was always part of the plan. If you have a bit of a green thumb or love greenery, you might even end up not wanting to leave Atsari Hotel. 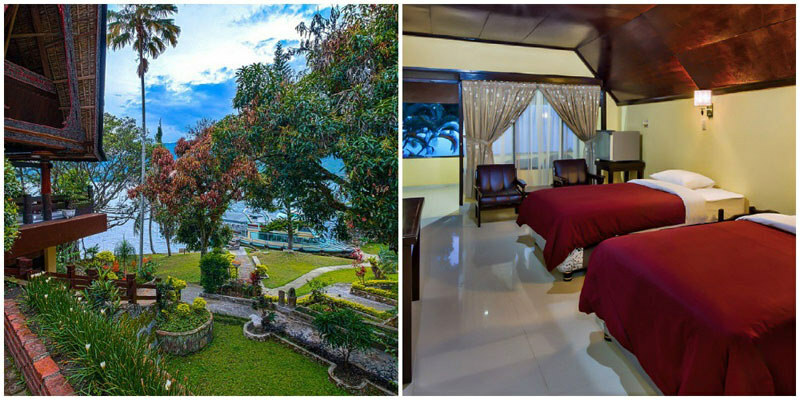 This classy hotel in Parapat not only faces Lake Toba, it’s also surrounded by greenery on its premises. There’re even trees planted in balconies! Cool at night and quiet in the day, the hotel’s spacious and well-furnished rooms are a prime choice for the tired traveller to crash for the day. 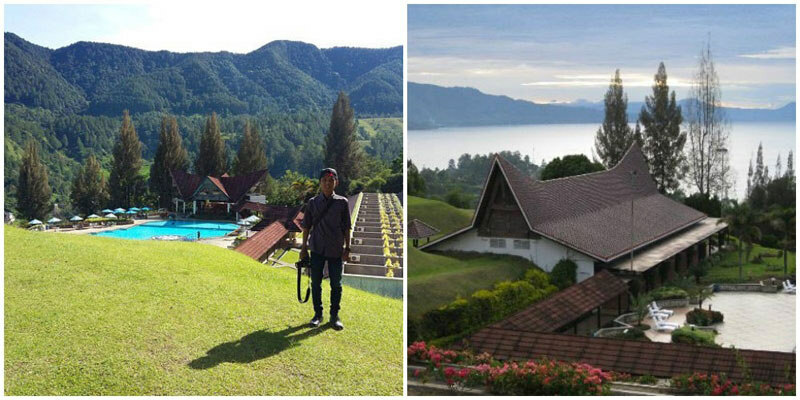 Perched on high terrain, Niagara Hotel and Resort offers never-ending views of Lake Toba that stretch on for miles. Simply furnished with spacious rooms, this is a decent, fuss-free option for a short stop in Parapat. Just make sure you get the rooms that face the lake, and the gratifying views will be able to appease any cranky traveller. Tuk Tuk is the place where Samosir island is most alive. Restaurants, bars, fun activities – all these and more are available in the area. Most eating establishments and popular restaurants can all be found here. In the evening, some places even offer Batak bands, dances, and traditional performances, showcasing the melodious music and strong vocals that the Batak people are so well-known for. In short, this is the place to have fun, get drunk, and stuff yourself silly. If you’re an advocate of the saying that you can never be too full, you’re already going to love the Maruba Restaurant. This restaurant has raving reviews from patrons and is highly hailed as the best restaurant on the island. The fish curry and sweet & sour chicken here is said to be drool-inducing, so don’t miss out on these dishes when you drop by! What could be better than a restaurant that serves jaw-droppingly good food? 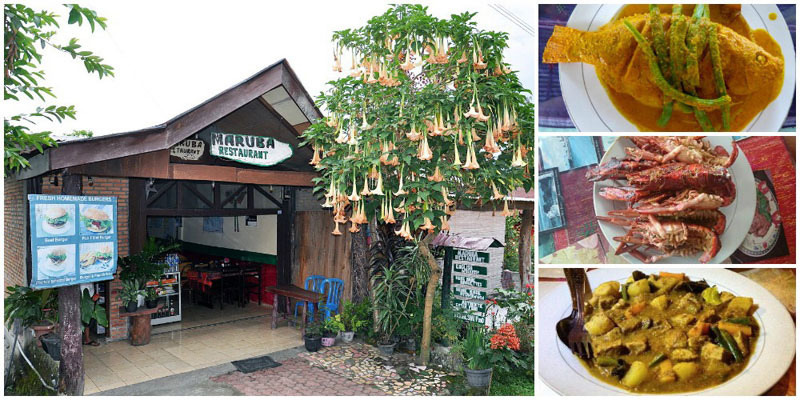 A restaurant that serves jaw-droppingly good food and allows you to order a feast, of course. When you make the order one day in advance, you and a friend will be able to enjoy a sumptuous traditional Batak meal. Yes, the Batak food that is so loved by customers. We wouldn’t mind starving for a whole day just to eat that. Location: Tuk Tuk, between Amberoba Hotel and Rodeo Accommodation. Love fresh fish? No fish can be fresher than what’s served at Jenny’s restaurant – fish from the lake grilled right in front of the store. If you’re a fish fan, Jenny’s the place to get your fix. The interior of the restaurant may not be up to the sky high standards of many restaurants and cafes these days, but if you know how to appreciate a well BBQ-ed fish, come join the queue in front of Jenny’s Restaurant. 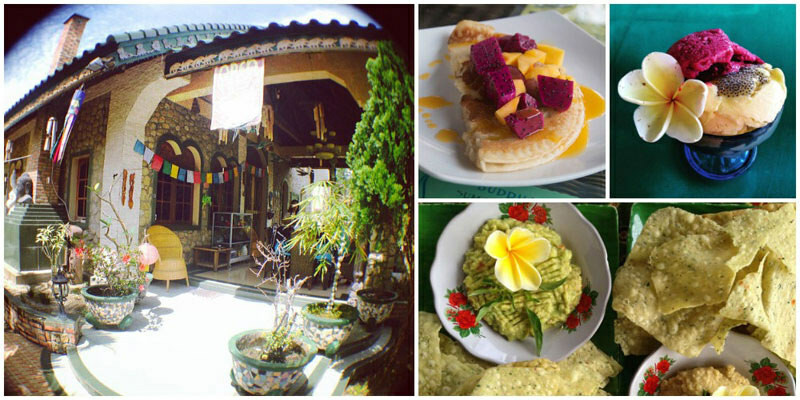 Even if you love your veggies and not meat, Samosir island has something for you. Buddha’s Cafe not only has a quiet garden design showcasing a sprawling view of the lake, it also has some of the best vegan food around. Whether you’re vegan or not, you’ll still fall in love with the cafe’s signature homemade sorbet ice cream. What could be better than enjoying a cup of ice cream after a tiring day out on the waters of the lake, right? Um, maybe all the other kinds of yummy food that’s listed on the menu. Ever had pork sak sang before? Well, we haven’t, and we think it’s time to start stuffing ourselves with pork. Horas Shugary is most well known for its large and delicious portions of pork sak sang, a local specialty grilled pork belly dish. 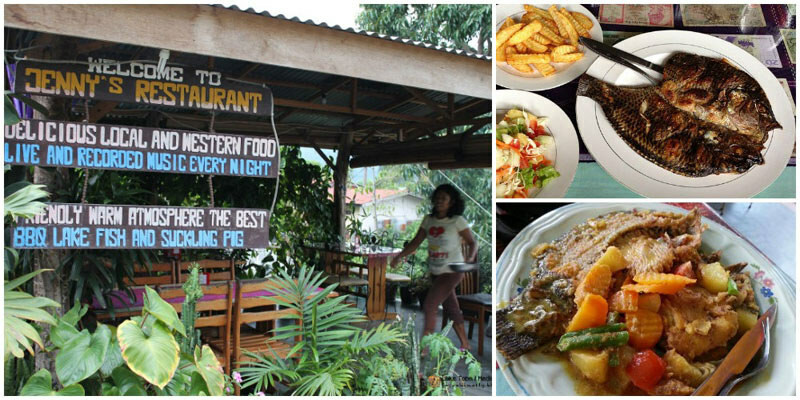 If pork ain’t your thing, the restaurant also serves both western and indonesian food to cater to everyone’s taste buds. The best thing is, you won’t even have to be sad about missing out on that one dish, because everything else, from the rendang to lobster, is just as delectable. Now that we’ve got your hierarchy of needs all covered from top to bottom, it’s time for the last hurdle and you’re off on another travel adventure! Before you click that “confirm” button on your air ticket booking… have you taken note of these things yet? i. Don’t let your electronic equipment die. There are instances of power failure in the island, which may extend until the next morning, so make sure you charge all your stuff before 9pm. ii. 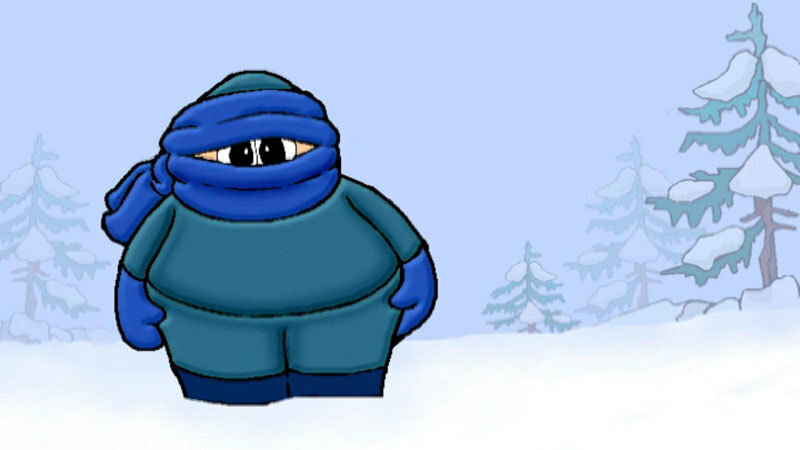 Don’t freeze to death. The weather is generally cool, but if you come from a tropical country where it’s normal to sweat half your life away every day, it would be prudent to bring a jacket along. iii. Don’t end up poor. 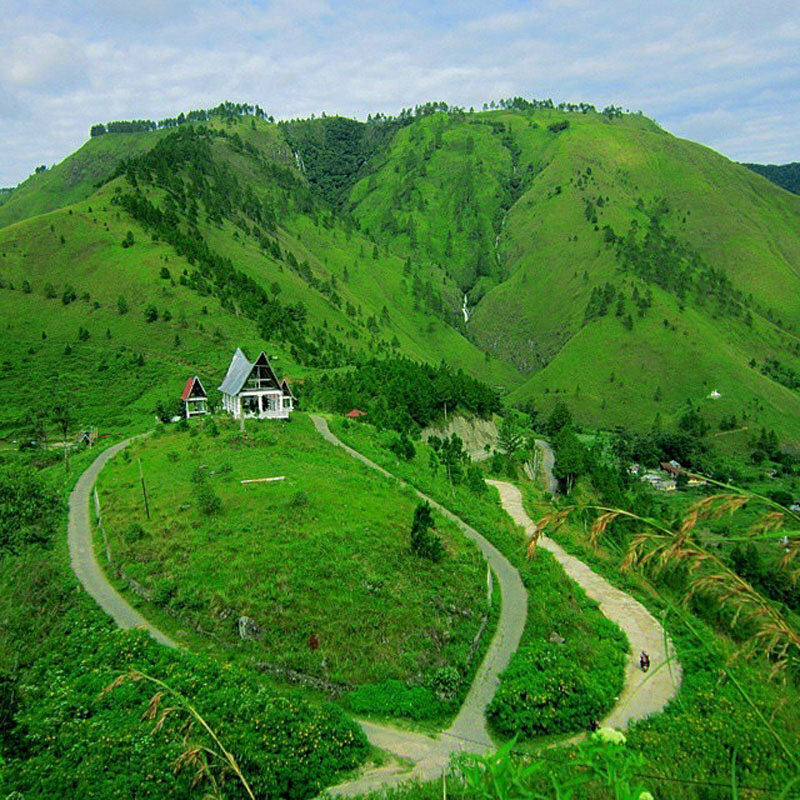 Exchange rates can be poor in the Lake Toba area, so try to get all the money you need before you leave Medan. There’s only one ATM on Samosir machine, which only accepts Cirrus and Mastercard. iv. Don’t freeze in the shower. Hot water may not be available at all times throughout the day, so be sure to check when hot water is available so you won’t have to bathe with icy cold water. Also, try to bathe before 9pm too, in order to prevent the water going out on you while you’re jumping around with shampoo in your eyes. 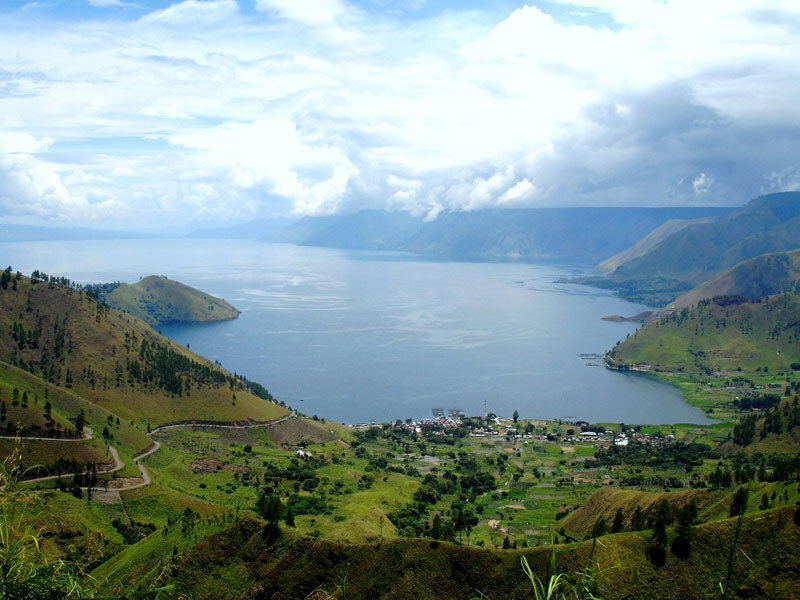 Now that you have read all there is to know about Lake Toba, you should definitely go check this beautiful place out in person. 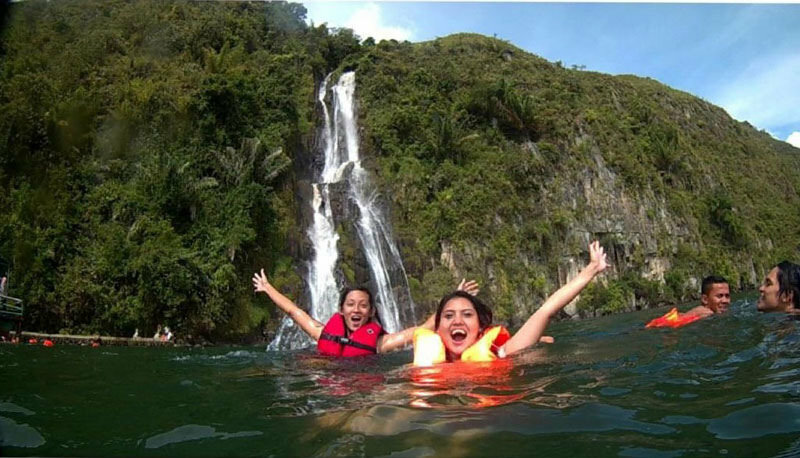 Let us know what is your favourite thing about Lake Toba below!